Many readers are understandably confused or puzzled when hearing a passage from the Book of Revelation. It is unfortunate, however, that many end up dismissing what they’ve heard. In so doing, they miss out on some of the most joyful passages of sacred Scripture. Yes, that’s right—joyful. The second characteristic of saints, which builds on the first, is that they are servants and sons of God. Logic tells us it is only proper for man be a servant to his Maker. God’s love, however, reveals and imparts an astounding truth: man is called to be a son of God by grace because of the sacrificial death of the Lamb. As sons, the saints are joined in the communion of the Church, the divine house of God (1 Tim. 3:15; Heb. 3:5-6). An essential part of the service rendered by the saints is prayer, worship, and praise. “We know that God does not listen to sinners,” Jesus told his disciples, “but if any one is a worshiper of God and does his will, God listens to him” (Jn. 9:21). 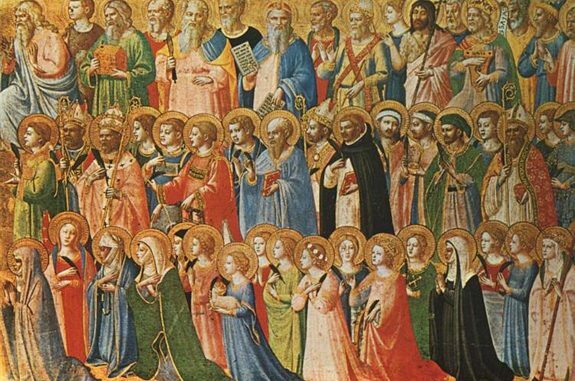 The saints on earth and in heaven worship and praise God because of the third characteristic: they are saved from sin and death. Baptized into Christ, they rise with him to eternal life. This can be seen in the description of the Church triumphant, which is a great multitude of “every nation, race, people, and tongue,” wearing white robes and carrying palm branches. Having survived “the time of great distress,” saints enter into eternal joy. The final chapter of the Bible describes that joy. “There shall no more be anything accursed, but the throne of God and of the Lamb shall be in it, and his servants shall worship him; they shall see his face, and his name shall be on their foreheads” (Rev. 22:3-4). That is what it means to be saint; that is the reason we were created.